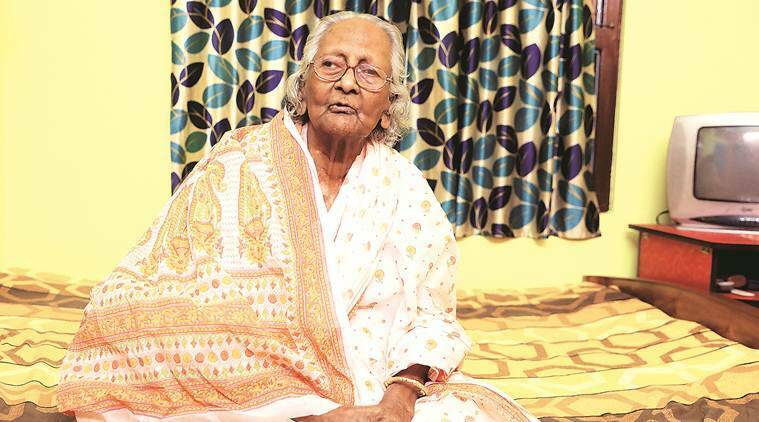 Eighty-nine-year-old Rani Kar looks frail, but is a woman of indomitable spirit. This Lok Sabha polls, she has taken it upon herself to make sure that people can exercise their right to vote without fear in West Bengal’s Raiganj, which goes to polls on Thursday. The 2017 civic polls and the 2018 panchayat polls in West Bengal witnessed violence and the Opposition alleged that people could not vote at many places. The incident Rani witnessed took place at Collegepara Government-sponsored Primary School. Her husband, a freedom fighter, who died in 2007, had donated the land and founded the primary school. “I was at home when the idea of a human chain struck me. Initially, I had doubts if anybody would bother to listen to me. Then I spoke to my son and some neighbours. They supported me and I decided to go ahead with my plan,” said Rani. On April 11, a day before the first phase of polling, her sons accompanied Rani to the office of the district magistrate who is also the district election officer and submitted a letter, seeking permission to form a human chain in support of the constitutional right of citizens. Next evening, Rani and her sons made a few placards and hit the streets. They were joined by a large number of people. From fruit sellers to teachers to shopowners and children, many people gathered and formed a human chain about a kilometre long. “I was surprised to see so many people. There were people I did not know. I tried to highlight the need to ensure a free and fair election. How can goons rob me of my democratic right to vote? I hope this time the administration ensures proper security. Everyone here is scared,” said Rani, who lives with her two sons, Ashish and Amit, daughter-in-laws and three grandchildren. She has two daughters who are married and live elsewhere. “It’s her idea. We just helped her. Everyone in Raiganj responded to her appeal. We are proud of her,” said Ashish. “Despite my hectic schedule, I could not resist being part of the human chain. I heard that an elderly woman had given a call for free and fair vote and I just had to be there,” said Anindya Sarkar, a doctor. “In many places, people could not vote during civic and panchayat polls. This time, too, people are scared. But there are also people like her (Rani) who protested in a unique way drawing the attention of the administration as well as the people of Raiganj. I support her,” Priyaranjan Pal, a teacher in Raiganj Coronation High School. In 2004, Rani’s younger son, Pulak, who was around 35 years old, was allegedly killed near their house after he protested against some eve-teasers.